A Florida woman killed a family of three, including the couple’s young child, while speeding at 121 miles per hour on Leroy Selmon Expressway, according to the Miami Herald. She has been charged with three counts of DUI manslaughter, DUI serious bodily injury, fleeing the scene of a crash that involved a fatality, fleeing the scene of a crash that involved serious bodily injury, and tampering with physical evidence. The defendant slammed into multiple vehicles, causing one of the cars to burst into flames, killing a father and burning the mother and daughter beyond recognition. After being arrested a few miles down the road where he car broke down, she was arrested and taken to a local hospital. At the hospital where tests were administered, the defendant allegedly tried to hide her blood samples in her underwear, which is where the tampering with evidence charge came in. Create, use a record, or present any document or thing that is known to be false. Violating any part of this statute constitutes a third degree felony, punishable by up to five years in prison and a fine of $5,000. Federal tampering laws are even more strict. Anyone caught tampering with evidence in a federal investigation can be charged with up to 20 years in prison, as per 18 U.S. Code § 1519. 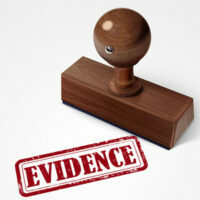 Tampering with evidence is a serious crime in Florida, and should not be taken lightly whether it is the only offense that you have been charged with or it is part of a long list of offenses tacked on to one event. We strongly urge you to act now by calling one of our criminal defense lawyers as soon as possible. The sooner you contact an attorney, the sooner they can begin working on your case and putting together a solid defense. Reach out to one of our attorneys with the Skier Law Firm in West Palm Beach today.